Background and Aim: Growth rates and regional differences in the use of cardiac imaging are potential metrics of quality of care. 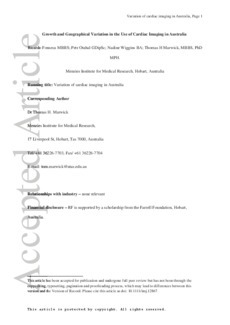 This study sought to define growth and regional variation in outpatient cardiac imaging in Australia. Methods: Analyses are based on the rate of outpatient transthoracic (TTE), transesophageal (TOE) and stress echocardiography (SE) and single-photon emission computed tomography (SPECT) per 100,000 people in each geographic insurance region in Australia (Medicare Local, ML). Numbers of tests from 2002-13 were obtained from Medicare Australia Statistics, and number of doctors was obtained from the Health Workforce data. Demographic data (total population, rural areas, and quintiles of disadvantage) were obtained from census data. Results: Over the past 11 years, TTE reimbursements/100 000 people increased from 1780 to 3497 (8.8% annualised growth), TOE from 33 to 61, SE from 181 to 947 and SPECT from 287 to 337. SE had the biggest increment, an average growth rate of 38.5%/year. The relationships between the use of each cardiac imaging techniques and demographic, medical and illness factors were analysed in outpatient tests reimbursed in 2012. For each additional medical practitioner per 1000 people, there was an increase in the rate of TTE (β = 1.25 (95% confidence interval CI: 1.17–1.33), P < 0.001), and TOE use (β = 1.13 (1.04–1.24), P = 0.005), independent of regional burden of cardiovascular disease and social determinants. For SPECT the largest independent correlate for testing was the percentage of women within the ML; each additional percentage increase resulted in doubling of the rate of testing (β = 2.25 (1.72–2.94), P < 0.001). Conclusion: Variation in the use of TTE in Australia does not appear illness-related and may be evidence of under- and over-utilization. An appropriate use process may contain this variation.